Mallorca Gourmet 121 is a new website that will keep track of new happenings on the gastronomy scene in Mallorca, Balearic Islands, Spain. Our main intention is to highlight and promote the wonderful, diverse gastronomy Mallorca has to offer. The website has a Gourmet Directory where we will be profiling gourmet products and businesses in English and Spanish. 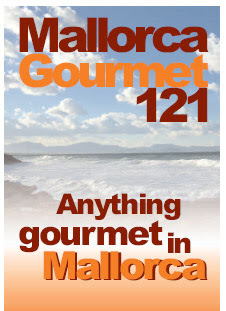 There will also be a membership section that will entitle you to a Mallorca Gourmet 121 Club Card. Here you will be able to benefit from special promotions which gourmet businesses will promote from time to time. There is current a award-winning guide book out , in its second edition, called Mallorca Restaurants 121 which has a gourmet directory section gastronomic highlights and events in Mallorca.